I have a confession to make. 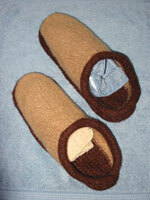 When I made my last post about the clogs, I had already felted them. I was just trying to be funny while waiting for the clogs to dry and for the suede soles I ordered to come in. Hehehe. I made the women’s large size (size 10) for a man with size 9.5 feet. 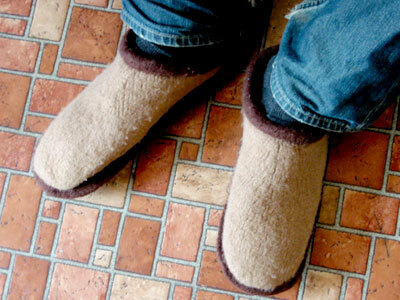 I ran the clogs through the wash about five times. Hot water, some detergent, lots of towels and assorted other stuff for agitation, heavy wash cycle. The Cascade 220 didn’t quite manage to shrink down to the recipient’s foot size; there’s an extra half-inch or so of extra room. But they’re done! Definitely a project to make again. 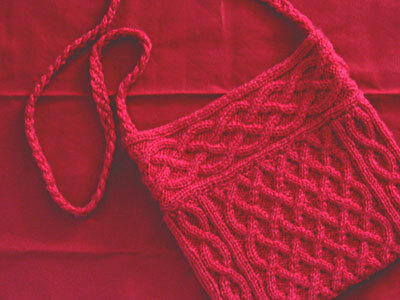 In other knitting news, here’s what I have in progress: A cabled bag of my own design, dubbed “Quinn.” The knitting is all finished, but it’s waiting for a lining and a zipper. I’ve been thinking about writing up the pattern for Quinn and offering it for download, even though any experienced cable-r should be able to reverse-engineer it easily. I figure it would be a good exercise in pattern-writing. This would be the bag I mentioned at the end of my Microspun rant. 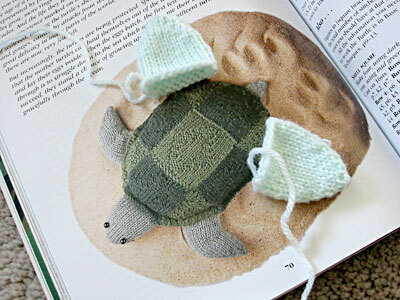 A stuffed turtle from World of Knitted Toys, first seen at the end of my Eggplant Bag entry. I had actually completed all the pieces for the head, limbs, and tail before deciding to rip out and start over. The pattern specifies knitting everything flat so it’s easy for beginners. But I hate seaming, and I would honestly rather rip it all and knit it in the round than deal with all that sewing. 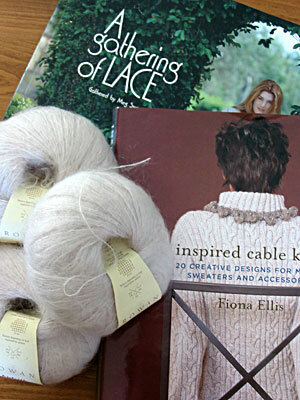 Plus it’ll give me a chance to practice knitting two tubes on two circs before I try doing it with socks. I’ve got the turtle’s two back feet finished so far. Yes, that would be three scrumptious skeins of Rowan Kidsilk Haze, soon to become something fantastic, I hope. 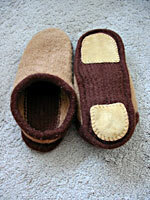 CogKnition posted this on April 30th, 2006 @ 3:26pm in Finished Objects, Knitting Goodies, Socks & Slippers, Unfinished Objects | Permalink to "Happy Feet"
Clogs and bag both look very nice! Can’t wait to see what you use that luscious KSH for.